Crazy Benchmade Coupon - What would you get? Discussion in 'General Knife Discussion' started by Gravy, Aug 12, 2018. So recently I had the rare opportunity of receiving a coupon code for use on Benchmade's website. This coupon allows me to purchase any knife that isn't a Gold class or an automatic for 60% off MSRP. Yea for real. I really wasn't in the market for a new Benchmade but I would be a fool to not make use of such a coupon. So what knife would you get for 60% off? Right now I'm considering the Anthem and the 51 Morpho. I already own a 940, so that's off the table. unwisefool and Chariotz4 like this. Knicked Digits, sXePhenomenal and Tommy-Chi like this. Which knife to get dilemma= solved. BITEME, Cursum Perficio, Yo Mama and 8 others like this. Fixed that for ya, Chris! GundaManiac, mdrgn79, shinyedges and 1 other person like this. Can you use it with knives from their customizer? If so, I would do a custom Crooked River Mini. If you like the Anthem that would be a good deal, I just don’t really like them. stuff_things and Pilsner like this. 60% off msrp or map? Cause doesn't seem like that much of a deal if it's off of msrp which is generally pretty high. Heck even map prices have climbed way too high for Benchmades qc issues. At least with some of the vendors here you can have them inspect before shipping to check for qc. Crossing fingers you get a good one. I'd say get the anthem. I'm getting one soon. Not inspected at all, crossing my fingers I don't have to send it in. Even if it’s 60% off the Benchmade website list price of $500, he’s getting a new Athem for $200. Seems like a good deal to me. FullMetalJackass and mdrgn79 like this. My favourite knife that I own and arguably the best thing they currently make in my opinion. The high price tag is certainly a barrier of ownership for some, but your coupon should help with that. Matter of fact, I'm carrying mine right now! Gary W. Graley, Tommy-Chi, mdrgn79 and 1 other person like this. MSRP is usually double that of what a vendor will sell the knife for. It's that way with Spyderco at least. It's likely not all that great of a deal, honestly. Anthem was underwhelming for me and I love the brand. I'd go with a 940-1 or a 550-1 (or 555-1 depending on size preference). Contego or Adamas if you want a big ol blade. Wish the Proxy was still around. So you'd get an Anthem for 200 instead of 500$ ? I'd probably buy that, sell it for 300 - 350, and then buy Reate. madcap_magician, Fire Beard and Mo2 like this. That’s quite an overstatement actually. The Anthem from most vendors goes for $425, whereas on Benchmades site it’s $500. With the coupon it works out to $212 shipped. It's actually not an overstatement at all. You can get a Spyderco Para 2 for around $120 from a few dealers and Spyderco's website has them listed for $210. The disparity can be even greater when you look at some of the less popular/older stock models. Clearly that isn't the case with Benchmade. With that being the case get the Anthem. If I could snag one for just over a 2 spot I'd be all over that. I love integrals and the knife reminds me of the Osbourne family of 940s. Perfect models for the axis. I'd get the anthem, I really like the new version of the axis lock it uses. I didn’t know it used a different version. What’s different about it? 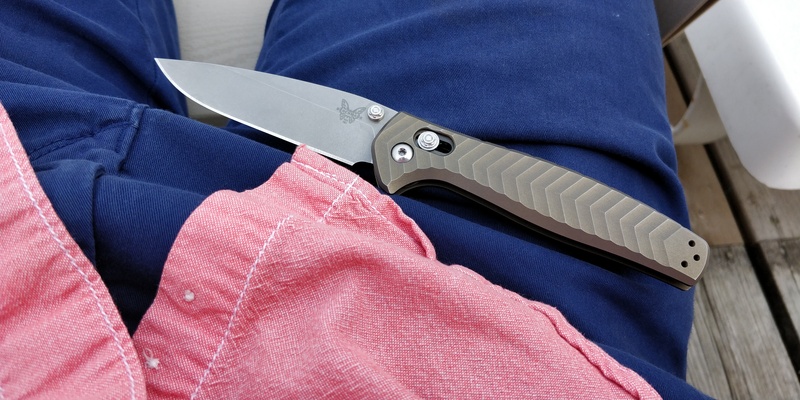 Also, I’d get the new SOCP folder, the Crooked River, Bugout or this might be a good time to scratch the Bali song itch since you will likely never get one cheaper. Guided Compression Spring and not an Omega Spring. I would be all over the 756 micro pocketrocket. What can I say, I'm weird.